Gemini Rue starts in medias res, with Delta-Six being memory wiped. You are then put into the shoes of Azriel, whom you control for the first part of the game. Then you control Delta-Six for a little while, and after that you are able to switch between them at will. Eventually, you will lose this ability due to how the story unfolds. Throughout the game, I was getting pretty confident in my ability to predict the ending and the twists – but I was very, very wrong. It came down to one wham line that I didn’t see coming, but fit perfectly into place. The game is great before that, but the third act that the wham line introduces is completely gripping. The atmosphere is heavily noir, with a generous helping of dystopian science fiction on top of that (the game is set in the year 2229, in space, but of course you find yourself in the city of Pittsburg – some things never change). Gemini Rue does a great job at making you feel like the world you’re in has a history to it – whenever I find myself wanting to know more about the setting of a story, I know it’s really engaging me. 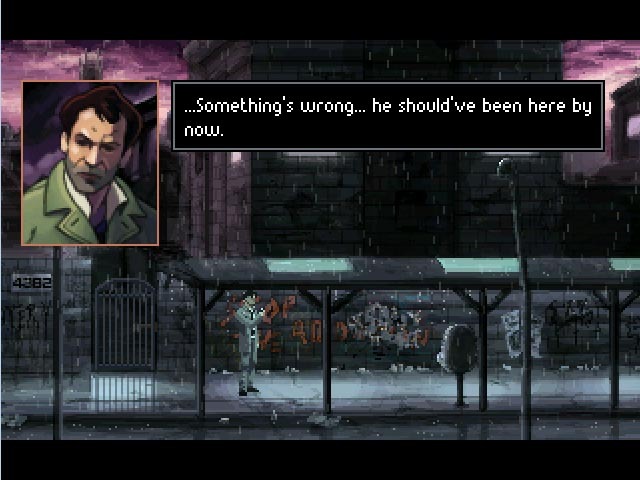 The feel of the game has been compared to Blade Runner, and it’s easy to see the influence, right down to the grizzled detective main character. 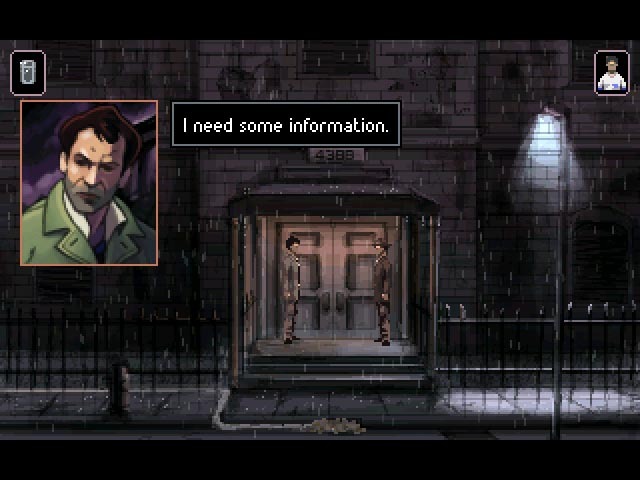 It’s also pretty unique for an adventure game in that it’s quite serious, and the themes are mature (drug smuggling and the mafia are major plot points, and there are gun fights). It can also get pretty creepy. There are about seven hours worth of gameplay, depending on how fast you solve puzzles and if you examine everything like I do. The ending was initially disappointing, but then the characters discussed it and I was much more satisfied with it. There’s nothing after the credits. 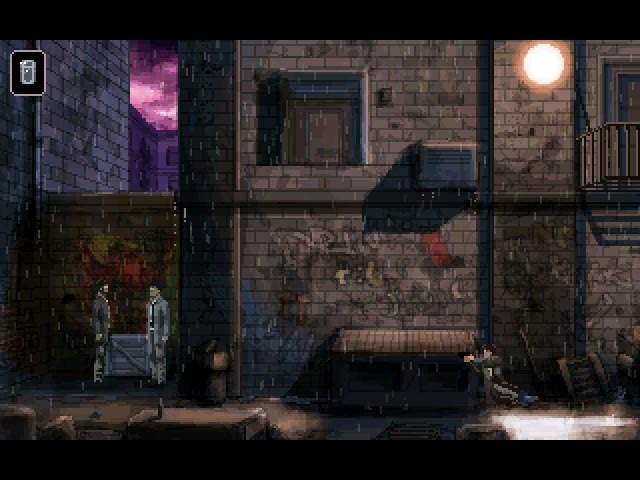 The graphics are deliberately in the style of 90s point-and-click adventures, which seems to be Wadjet Eye Games’s niche (recall Primordia, which I reviewed a while back). However, the graphics are just a touch more detailed than games from the 90s, and I was particularly impressed with the rain effect. Gemini Rue looked beautifully crisp on my iPad’s screen. It’s never colorful, but that’s okay because of the setting – there are a couple gorgeous shots of space travel that add a little color to an otherwise very grey/dark game. 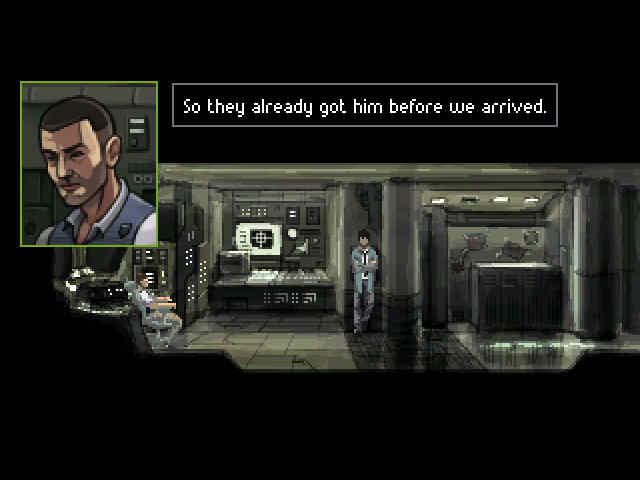 Another feature that is different from a typical 90s adventure game is the inclusion of character portraits. When a major character is speaking, a portrait pops up in the top left corner so that you can see his or her face. It’s a nice touch that gives you a little more ability to connect with the characters, considering they don’t have visible facial features in their normal state. Voice acting is generally excellent, although sometimes I noticed discrepancies in pronunciations of names between different characters. Azriel in particular was fun to listen to – he basically growls everything. The Director of the facility where Delta-Six lives also impressed me; he was a perfect balance of charming and creepy that worked fantastically for the part. There were a couple of sound-alikes – I thought I heard Kath Soucie, but was mistaken, and there’s one gangster bit character who was definitely influenced by Steve Buscemi. You’re able to choose between voice/text or text only – there is no way to turn subtitles off. What little music there is is beautiful, and I wish there was more of it (especially the tracks that use trumpets!). Other than that, you’re basically going to be listening to a LOT of rain. There’s also a developer commentary included, which more and more games are incorporating. I really like this trend and hope it continues – I’m looking forward to playing the game over again with the commentary on. There is so much insight into how movies are made (practically every DVD has at least a making-of featurette), but we don’t often get behind-the-scenes looks at video games. I think it’s fascinating to hear the thought process behind their creation. The game warns you before you turn it on to play through the game at least once so as to avoid spoiling it for yourself. The game controls excellently on the iPad. The aformented hotspot finder is utilized by simply holding down on the screen, which will then show you everything you can interact with (except for people, oddly, but I guess you don’t really have to pixel hunt to find them). You can also drag your finger around the screen if you want to pixel hunt the old-fashioned way. The only minor annoyance I had was that sometimes it was difficult to exit a room on the first try, but once I got the hang of how doors in the game worked, it got better. It’s also easy to accidentally skip a line of dialogue by tapping on the screen while someone is talking, which can be convenient if you read quickly or annoying if you miss something important and you didn’t mean to – so keep your fingers off the screen during conversation. You never have to carry much in your inventory, and you also never have to combine two items to make another. Your inventory also contains the options you use to interact with the world – eye (look), hand (interact with), mouth (talk), and foot (kick!). When you speak to people, the dialogue options will change color so you avoid asking a question that you already asked. Dialogue is not very involved – the trees don’t go more than a few layers deep, and neither Azriel or Delta-Six are big talkers. A unique aspect of Gemini Rue is that instead of simply taking your gun from your inventory and using it on someone to shoot them, you actually have to shoot them. I found this difficult to master, still struggling with it at the end of the game even after switching the combat difficulty from medium to easy. You start in cover, and have to figure out the precise time to come out of cover and shoot your opponent(s) so that they don’t have time to shoot you back. You can also get in a headshot if you have really great timing. Sometimes I found this easy to pull off, and sometimes I ended up dying and having to restart. I never had to play a fight over more than twice though, so it didn’t move into frustrating territory. Sometimes you will have another character following you around, and you can tell them to do things for you that you either don’t have the skills for or need a second body to help with – for example, Delta-Six’s friend, Epsilon-Five, will help you get into a girls’ dormitory. She also has computer skills that Delta-Six does not. There’s an in-game hint system that you can access by calling up your partner, Kane, but he’s pretty useless. I had to use a walkthrough a few times, but the puzzles are logical, for the most part, and the game’s linearity makes it so you are never really overwhelmed with what to do next. You have access to a “communicator” (smart phone) that keeps track of notes, names, and phone numbers that you need, which would definitely be useful if you came back to the game after a hiatus. This also comes in handy when searching computer terminals, because you can just drag a name you want to look up into the search bar from your phone instead of typing it out. You can save at any time, and the game will also autosave for you at certain points. You shouldn’t rely on just using the autosave though, as the game doesn’t do it often enough. Also, if the game autosaves, get ready to probably have to shoot people or otherwise put yourself in danger. I noticed a few references (Monkey Island, Star Wars, Bioshock, Battlestar Galactica, and Cowboy Bebop, with the last being characters that you can find if you’re lucky – I only found one and, having never seen Cowboy Bebob, was pretty confused until I looked it up! ), but the game generally stays contained within itself and never breaks the fourth wall. Gemini Rue has an amazing sci-fi/noir story and is only hampered by some small, finicky mechanics. 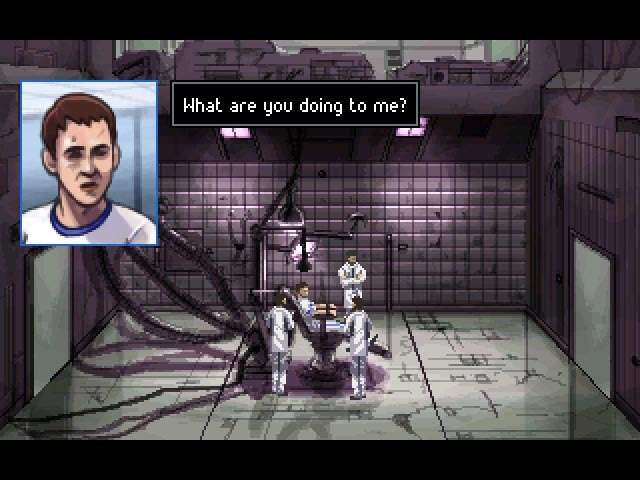 This is another excellent offering from Wadjet Eye Games – if you like point-and-click adventures and/or science fiction, you can’t really go wrong with this one. You can get Gemini Rue for iOS in the app store for $4.99. It’s available for iPhone, iPod Touch, and iPad and requires iOS 4.3 or later. This app is optimized for the iPhone 5. And, if you don’t have an iDevice, you can also get Gemini Rue at the official site, GOG, and Steam. There’s also a PC demo. Check out Wadjet Eye Games’s official site, like them on Facebook, and follow them on Twitter. Really?! That’s awesome! I don’t think I have ever heard a more beautiful trumpet. I will change it in the review, thank you!